The 7 Best Candy Shops in Wyoming! There’s the sour, the sweet, the crunchy, the salty, the chocolatey, whatever the flavor, the love of the candy store is universal. The nostalgia it invokes is unmatched. And in the rugged grasslands and mountains of Wyoming, you’ll find a state teeming with this nostalgia. Candy has rooted itself into the recreation and culinary fabric of the Equality State. Here are the seven best candy stores in Wyoming. With literal barrels full of candy, Yippy IO is exceedingly charming, not only in inherent nostalgia, but in sheer selection of treats. The sweet plethora divides into four categories, all with several sub-genres. 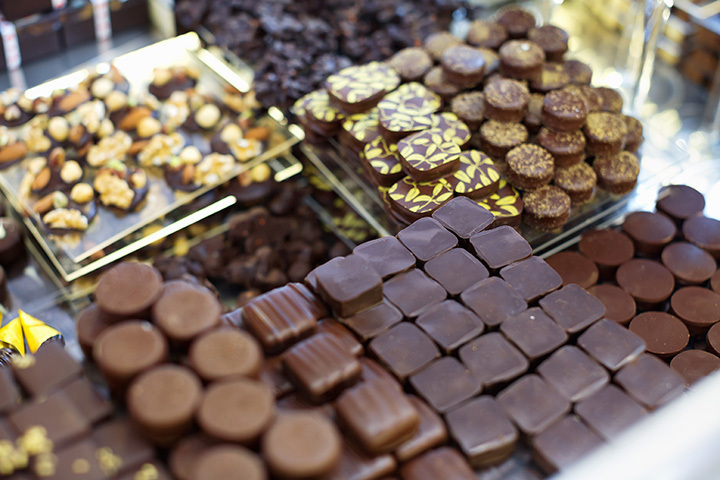 There’re chocolates (house-made truffles, bars and nougats), saltwater taffy (38 flavors! ), Jelly Belly and store favorites. While the truffles and taffies are exquisite, the section of candy classics is unmatched in the state: remember Big Hunk? Dubble Bubble? Jawbreakers? They’re all here, by the gallon. For nearly 15 years, Cowtown has crafted delicious treats, made in-house, from organic ingredients. Though the shop crafts some more unique confections, including caramel apples and “seafoam" (a devil’s food-like meringue covered in chocolate), this Cody institution is renowned for its chocolates. One simply mustn’t miss the lusciously-dense fudge or handmade truffles (buttercream and sea salt are excellent). Spawning from a small candy shop circa 1956, Donnell’s has managed to corral and tame the wily compounds of chocolatey, sweet and salty. With the company still family-run, and sans a much-needed expansion in 2014, this chocolatier is sugary nostalgia preserved in amber. The sweets are made on-site, by hand, in small batches, from a centuries worth of combined candy-making experience. If the ingredients and execution weren’t attractive enough, rest assured, the chocolate is certified fair-trade. The truffles and bars are stellar, juxtaposed with the salty crunch of brittles, barks and seasonal treats. For over a decade, Meeteetse chocolatier Tim Kellogg has become renowned for producing no-nonsense and expertly executed chocolates. In a town of a few hundred, the former buckin’ bronc’ rider crafts each batch himself. This results in intimately-crafted sweets that epitomize hand crafted, and surprising flavors including whiskey, stout and mesquite. On top of fine technique and singular taste, the establishment is steadfast in its commitment to conservation and limiting waste. Recycling and repurposing, and using responsibly sourced ingredients, produces only one bag of trash each week. The Cellar’s bright blue awning and aged-wood door immediately invite from the street. The house-made chocolates are velvety, buttery-sweet and exude that unctuous depth of quality dark bittersweet. In a state with a long history of sweets (being one of the few luxuries during Westward Expansion), this establishment reinforces its quality product with an attentive staff and an openness to customization. Staff are more than willing to discuss a guest’s sweet preferences and craft a package catered to individualized tastes. The town of Afton is one of many in the historically fertile “Star of All Valleys.” Renowned for its abundance of game and deposits of salt and minerals, Mormon pioneers gave the area it’s Western name (eventually shortened to “Star Valley”). Star Valley Chocolates embraces this lineage, and in a humble, Swiss chalet-style building, crafts delectable fudge, cakes, cookies, candies and individual chocolates. And though frontier lifestyle has all but evaporated, a Star Valley candy handily inspires the simple, sated bliss of a pioneer satisfying her sweet tooth. Some prefer sour, or caramel, or bubblegum. Sure, they’ve house-made caramels and a selection of truffles, but at Nana’s, it’s all about one thing: fudge. And it’s absolutely fantastic. Dense, marshmallowy fudge is painstakingly handmade, with twelve flavors offered daily, drawn from a rotating list of over sixty varieties! The Rocky Road, watermelon and Butterfinger versions are surprisingly nuanced and indicative of the store’s dedication to not only outright delectable fudge, but creative varieties to keep the frequenter, and the palate, entertained.